Few things can get collectors more in a frenzy than rookie cards, and the 2017 Leaf Rookie Retro set makes these popular options the central focus. Inside each sealed box is one slabbed buyback rookie card. Part of Leaf's extensive repackaged selection, 2017 Leaf Rookie Retro continues the brand with a new batch of notable options. Every buyback card is professionally graded and/or authenticated. There is also one original Rookie card insert found in each box. The multi-sport checklist moves freely across different sports and decades, including key baseball, basketball, football and hockey releases. 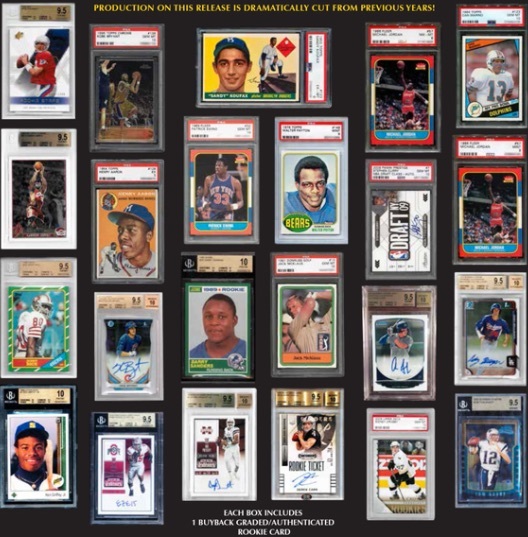 The sell sheet teased many current stars, Hall of Fame legends from various sports and even a couple 2017 rookie subjects. Promising a considerable cut in production from prior editions, 2017 Leaf Rookie Retro drops from five boxes to four boxes per case in comparison to 2016.